Students attended a keynote address by Lisa Barrow, senior official at the Chicago Fed. 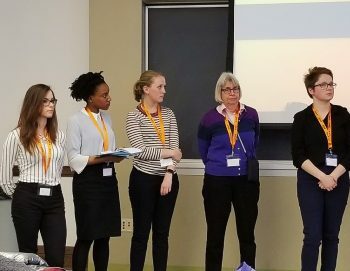 A group of five W&L students, along with Linda Hooks, Professor of Economics and Head of the Economics Department, recently attended the Annual Conference of Undergraduate Women in Economics at the University of Illinois at Urbana-Campaign. Lisa Barrow, Senior Economist and Research Advisor at the Federal Reserve Bank of Chicago, gave the keynote remarks. The conference is one component of the Undergraduate Women in Economics Challenge (UWE), which was launched in January of 2015 by Claudia Goldin, the Henry Lee Professor of Economics at Harvard University, and Tatyana Avilova, current PhD student at Columbia University. The UWE seeks to promote the economics major to undergraduate women in the hopes of improving the current ratio of male to female economics majors across the country. According to the UWE website, there are currently about three men for every woman majoring in economics nationwide. Economics departments from across the USA have been asked to join the effort to raise awareness of the gender gap, and to seek solutions to several common causes identified by the UWE Board of Experts. Gabby Smith ’20 (center) helps her group with a case study presentation. The W&L group’s travel to the conference was funded by a grant from the UWE. To learn more about the UWE Challenge, visit https://scholar.harvard.edu/goldin/UWE and to learn more about the 2018 conference, visit https://ileconomics.wixsite.com/uwe2018.